PÜR Cosmetics prides themselves on being the complexion authority. And I almost agree with them. 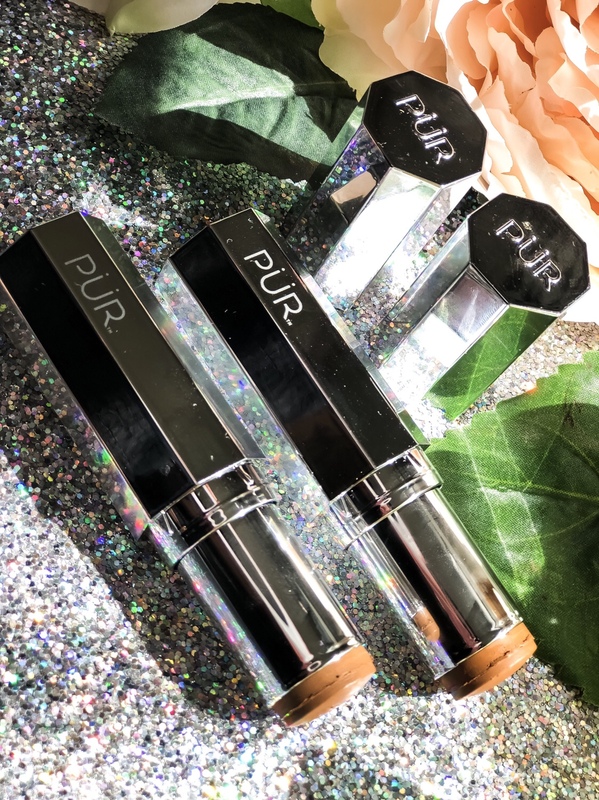 My buddies over at PÜR Cosmetics sent over the 4-in-1 Foundation Stick in 2 shades: Deep and Deeper. They’re not the deepest shades in the range. But they’re the only ones you’d be able to get your hands on in stores. I don’t like that. I do, however, love the formula though! I can’t lie. I’d definitely hail PÜR the “complexion authority” if they included all 24 of their shades in stores. Because the 4-in-1 Foundation Stick is pretty damn impressive! I received 2 shades of the 4-in-1 Foundation Stick in Deep and Deeper. Deep is a neutral brown with a yellow undertone. While Deeper is slightly darker and cooler with a slight red undertone. They’re very similar in color so both shades work for me. Deep is a hair light but Deeper can pull a little dark with a full on summer tan. Sometimes I mix the two but I often just wear Deep and warm up the color with contour and bronzer. I haven’t used the 4-in-1 Foundation Stick consistently enough to notice long term results. However, PÜR’s claims completely shine through when you wear the 4-in-1 Foundation Stick. Thanks to the buildable coverage, my skin indeed looks much more even. Surprisingly, the formula is quite comfortable and somehow a bit moisturizing as well despite the matte finish. My skin always looks ultra smooth and radiant every time I wear the PÜR 4-in-1 Foundation Stick. My skin is dry to normal. So I prefer a little extra moisture when I prep for matte foundations like the 4-in-1 Foundation Stick. The PÜR Cosmetics 4-in-1 Correcting Primer works like a charm to hydrate and plump my skin for a smooth, buttery application. On its own, the 4-in-1 Foundation Stick still looks great but it certainly looks smoother and wears better throughout the day with a hydrating primer underneath. I don’t usually reach for foundation sticks much but PÜR is certainly changing my mind. The 4-in-1 Foundation Stick is quite creamy and blends rather well using a brush or a sponge. I’m sure you could even use your fingers too! I prefer to use a brush to maximize the coverage on my full glam days. And a sponge for that soft airbrush look on my natural days. The 4-in-1 Foundation Stick is extremely impressive when it comes to photography. This is definitely a foundation you’ll want to try it you take a lot of pictures! It has a matte finish but it truly is velvety smooth. The 4-in-1 Foundation Stick doesn’t look cakey, flat or unnatural even when built up for extra coverage. My smile lines are my biggest challenge when it comes to foundation. By midday, my foundation always creeps into my smile lines and creases. I’m quite pleased to report that the 4-in-1 Foundation Stick doesn’t really give me this problem. I still notice some slight creasing by the end of the day. However, it’s not nearly as noticeable in person or in pictures as other foundations I own. Making the PÜR 4-in-1 Foundation Stick a great option for ladies with fine lines and textured skin. The formula holds up quite nicely throughout the day, in general. It doesn’t separate or look cakey. And I found that it even holds up nicely in the summer heat. I was able to break a little sweat without my face completely melting off or losing coverage in certain areas. Is the PÜR Cosmetics 4-in-1 Foundation Stick Worth It? Absolutely! I think it’s a pretty solid foundation for the price that looks very natural and works well. I commend PÜR Cosmetics for putting in the work and offering a suitable range for women of color too. But I would love to see those deeper shades in stores! It’s hard color matching in person. So it seems virtually impossible to do it online, right? Thankfully, we have the internet to help! Got a good foundation match already? Plug it into Findation and it’ll help you find a good match in the 4-in-1 Foundation Stick. My ladies with a bit less melanin can catch the 4-in-1 Foundation Stick online and in stores at Ulta Beauty and Kohl’s.